I have been concentrating lately on the Story portion of this blog and not the Song portion. So today I thought I’d lighten things up and talk about my “little” guitar. When I was young I had a Martin 0-16NY guitar. This was a very plain instrument and it was strung for folk style playing, so I could only use steel strings that had silk cores. It was a wonderfully crafted instrument. However I had a lot of trouble with intonation. Martin never used compensated bridge saddles. 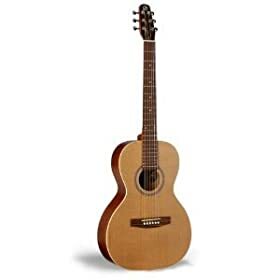 I traded it for my Ovation Classic Electric that I played for many years. But I always missed my small sized parlor guitar. I bought this guitar a few years ago. It’s a Seagull Grand parlor guitar. Back in the 19th Century guitars were quite different animals than they are today. First of all they were all strung with gut string which was brittle, but there was not as much tension on the neck and body. 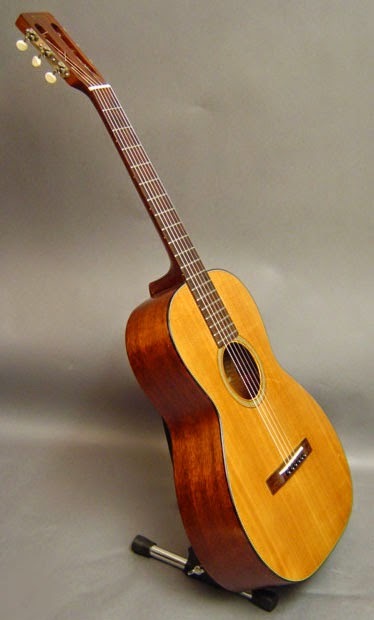 Spanish style guitars had slightly larger bodies than the common household guitar that was commonly known as a parlor guitar. No one has parlors in their home any longer. A parlor is what we call a living room or family room. Before TV and radio, folks would gather in the parlor for conversation and entertainment or just to read a book. The Seagull fits the bill. The construction is not quite as fine as the Martin, but it is still a quality instrument. The top is Canadian cedar and is solid. The back and sides are made of 3 ply cherry wood. The neck is mahogany and is made in the old style of cutting the headstock end off at an angle and re-attaching it by reversing it for the angle break. The headstock is also sort of a triangle shape so that the strings all have a straight pull from the bridge pin to the tuning keys. An added feature is the neck attaches to the body at the 14th fret. Most parlor guitars attach at the 12th fret, in the tradition of classical and flamenco instruments. Those extra two frets can be very helpful in playing. The sound is a little less than you would get from a larger bodied guitar. I lowered the action and it fingers nicely. The neck is somewhat larger than what a lot of folks like, but I'm used to wider necks as long as the action is not too high.